There is a lot to love about our house, but Phil suffered two disappointments when we bought it back in 1995. One was that the staircase was enclosed, because he had always envisioned watching children run excitedly down the stairs on Christmas morning. The other was the smallish dining room, because he dreamed of hosting big family gatherings. We couldn’t do much about the staircase, but in 2004 we enlarged the dining room by demolishing the wall between it and a small former bedroom. Our oval dining room table was dwarfed in the newly expanded space. One day at work he asked one of the doctors where he would recommend buying a large table. “Phil,” answered Dr. Richard Jennett in his broad New York accent, “you don’t buy tables, you build tables,” and promptly offered to build us a made-to-measure oak table. We designed a seven-foot-long by 40-inch wide table with two 18-inch leaves. Fully extended, the table is ten feet long and seats up to 14. 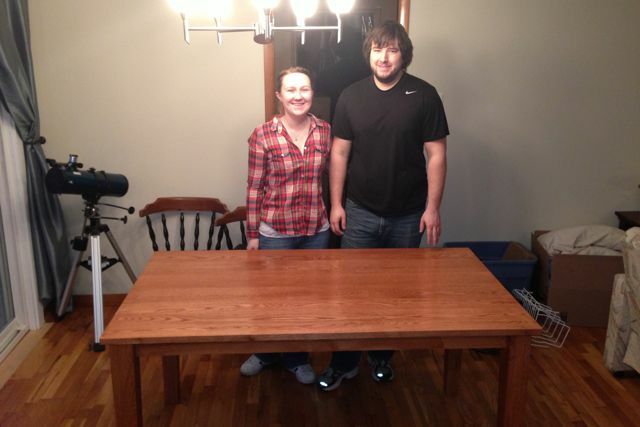 Left, the dining room table at its regular 7-foot length. Right, progressive dinner dessert before Hanna’s senior prom, one of the first occasions to utilize the fully extended table. Dr. Jennett learned carpentry from his father and grandfather; he still uses some of his grandfather’s tools. Phil was just an observer for the table project, but he became very interested in the construction process. He started accompanying Dr. Jennett on tree-cutting excursions and helped to mill and stack lumber. Dr. Jennett helped Phil refinish a table inherited from Phil’s grandpa Jake. Another of Phil’s hobbies is canning. He enjoys making salsa, pickles, relishes and especially jellies and apple butter. He decided that he would like to build a jelly cabinet to store his output. Dr. Rich Jennett and Phil with the jelly cabinet. We are deeply indebted to Dr. Jennett for his generous contribution of time, expertise, materials and tools. 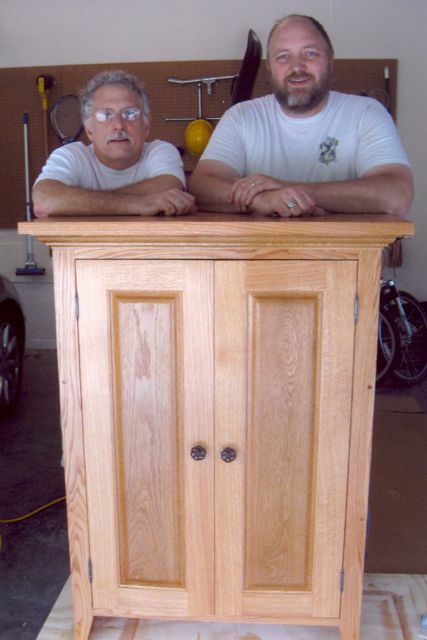 The next project was a pair of cedar chests for Laura and his friend Doug’s daughter Joni. 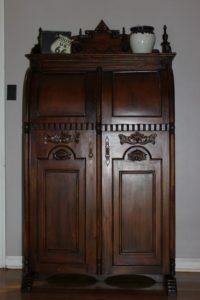 He asked me what I would like for him to build next, and I requested an armoire. This was an ambitious project, but he completed it in time for my Christmas gift. 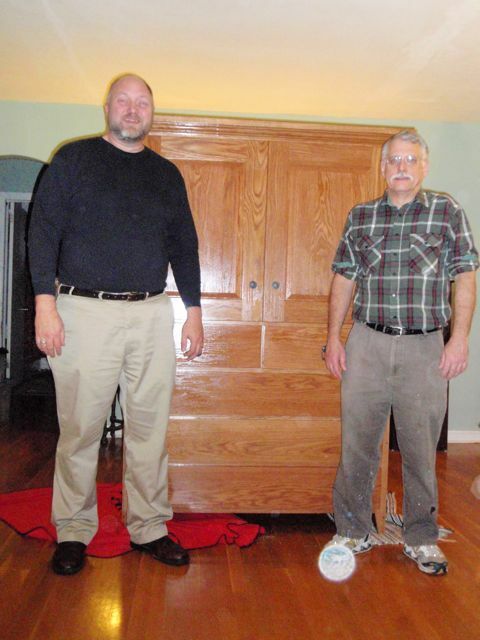 Phil and Dr. Jennett with my white oak Shaker style armoire with raised panels. 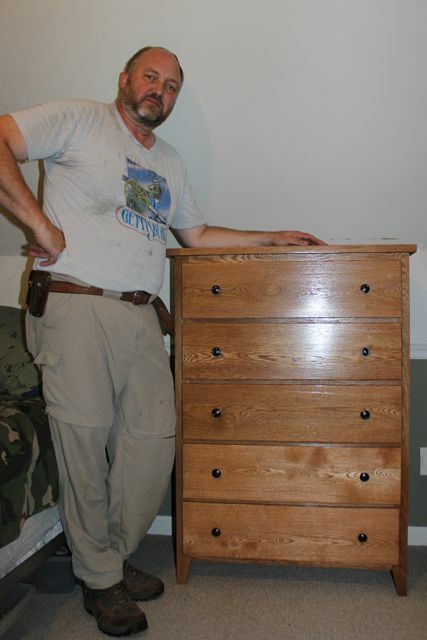 Phil’s chest of drawers, built to match my armoire. 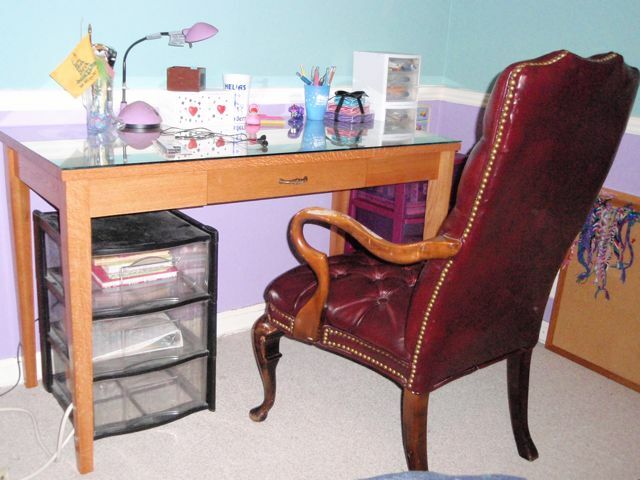 followed closely by a pair of desks for Laura and Hanna. Laura’s desk. Hanna’s has a slightly lighter finish, and she opted to forego drawer hardware. The next Christmas Phil presented his mom with a secretary that he restored after it was damaged during storage in an outbuilding. 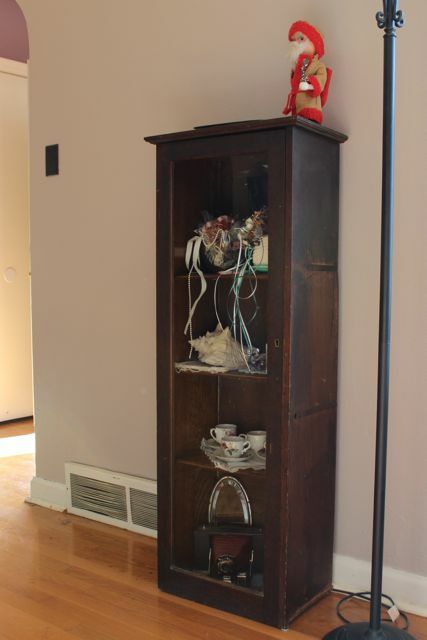 Ethel was delighted and now uses the piece to display her collection of milk glass. The mirror in this secretary was dated 1900. The piece had been neglected in a storage shed for some 40 years. 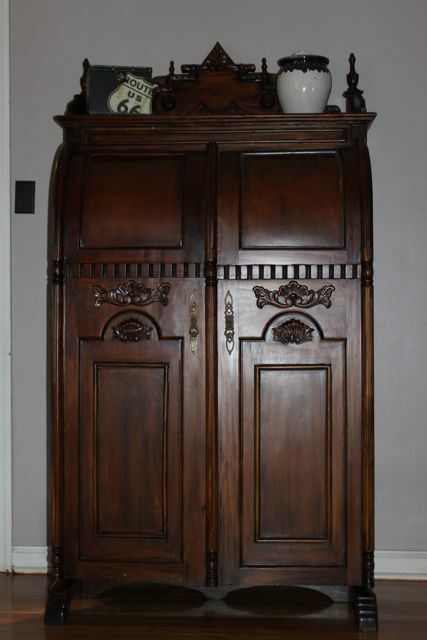 Phil replaced the legs, shelves and missing decorative trim and refinished the entire piece. Phil did another restoration of a desk for a former colleague at JCMG and built a table for pamphlets and flu masks at the reception area. By this time he was comfortable enough to build small projects without drawing a detailed plan. He built a standing desk for an old laptop computer that we use primarily for our movie collection database and a side table. The side table is perfect for extra seating or serving snacks. 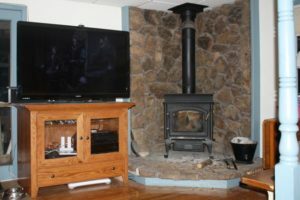 We designed a media center for our family room after replacing the wood stove. Phil built a table for his niece. Julia and her boyfriend Shane. And so that Joseph would not feel neglected, he also got a chest of drawers. Phil does beautiful work. 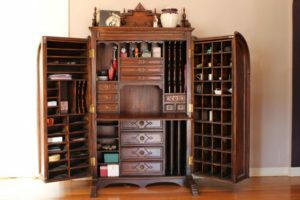 I think that woodworking is a great hobby for him – it is both creative and functional. I expect these pieces to be handed down and will one day be antiques in their own right. I can’t recall exactly how long ago I first caught the antique bug. When Hanna and I moved back to Jefferson City, we settled into a rental house on Marshall Street. To my delight, an antique store named Memories and Wishes opened right next door. Hanna soon charmed the owners, who usually let her select a trinket from a special box. We stopped in almost every weekend. 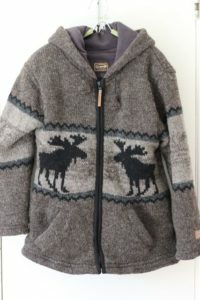 I repaid their kindness by making a purchase when something caught my eye that I was able to afford. 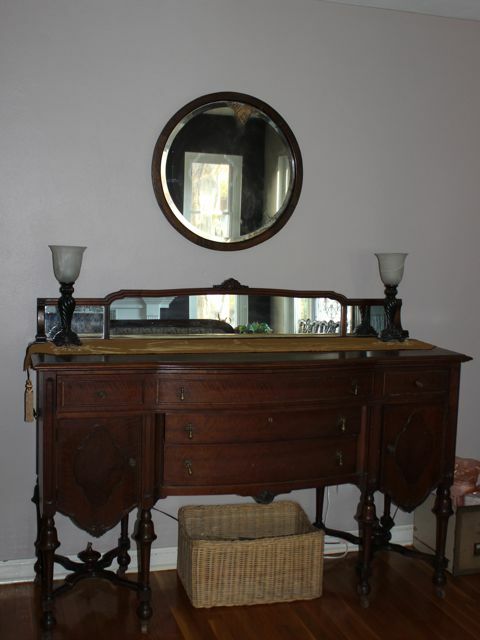 My first acquisition was a eight-foot bench that still graces our upstairs hall. Since then I have picked up other pieces here and there, many for our front room (of last week’s redecoration fame). I picked up two of our front room pieces in the period before meeting Phil. The first was a trestle table that I initially used as a computer table. I bought it during my lean single-parent years using the proceeds from a $25 savings bond my grandmother had given to me when I was a baby. I had never cashed it in for college, and it accumulated enough interest over the years to cash out at exactly the amount I needed for the table. Phil likes to call this our “library table.” It is a repository for incoming mail, packages, etc. The clock and the radio/CD player are reproductions. Phil received the clock for ten years of service at Missouri Hospital Association. The second piece was a small display case. It’s not a fabulous piece, but I have always liked its lines. My wedding bouquet and Hanna’s flower girl basket are kept in this display case along with an antique camera, some teacups and Phil’s baby doll, Henry. Ugly Santa is perched there for this year’s holiday season. Phil had some antique pieces of his own, including a little smoking stand that he inherited from his great uncle Alonzo. The space behind the door is lined with copper and has a strike plate for lighting matches. When Phil and I bought our current house, his living room furniture went to the family room while mine furnished the front room. My couch was worn to the point of always having a slipcover thrown over it, but we were waiting until Joseph started school before replacing it. That plan flew out the window when I visited an antique store and found this gorgeous secretary. If you ever watch the movie Arsenic and Old Lace, pay attention to the scene where Cary Grant calls his attorney – there is a secretary just like this one. Hanna and Laura argue over who will inherit this piece when I die. I think I may be cremated and buried in it. I also spotted a sofa and loveseat that complemented the secretary. The upholstery coordinated perfectly with the old Bayberry green walls. It also looks great with the new paint colors. It’s starting to wear thin in a few spots, though, so I need to give some thought to reupholstery – not a job I wish to tackle myself. Since I was also interested in a curio table, I was able to negotiate a substantial discount for the four pieces. Thank goodness. The houseplants love the southern exposure. When I was growing up, my parents had a lovely old buffet. When we moved my mom to Jefferson City after my dad died, my brother insisted that I take it. I was hesitant at first, but now I’m glad that I agreed. The buffet turned out to be a great place to store knitting and sewing supplies. There is an interesting annual phenomenon in Jefferson City known as Spring Clean Up. On a specified date, residents may place unwanted items at the curb instead of fitting everything into their 65-gallon dumpster. Pickups cruise all over the city the weekend before as their occupants seek treasures among the trash. As a rule I don’t participate, but one year I spotted this circular mirror in our neighborhood and was intrigued enough to stop and pick it up. It’s hard to see in the photo, but toward the top of the round mirror, some silver is rubbed off and a bit of yellowed Wall Street Journal peeks through. When the kids were younger we used to go to the annual St. Paul Lutheran High School fundraiser in Concordia. My dad grew up in Concordia and Phil and I were married there. 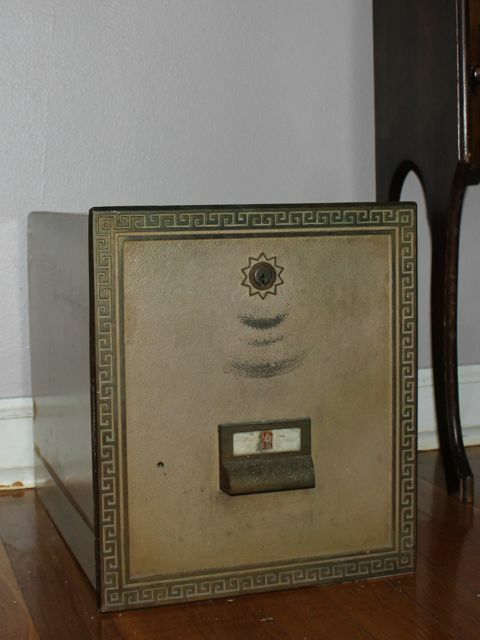 There was not often much in my price range, but one year the former post office box for St. Paul was up for auction. 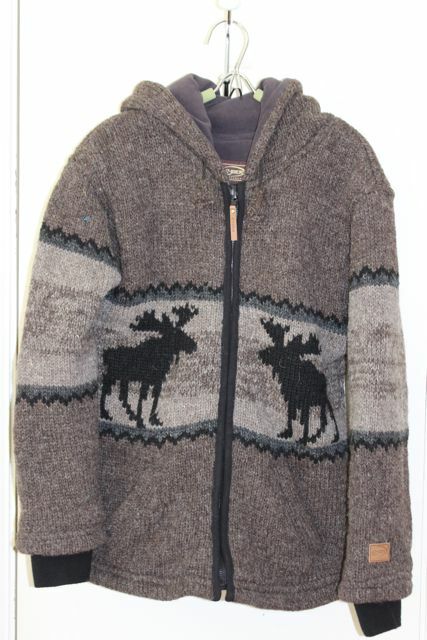 Nobody was bidding and the auctioneer was stuck at $10 so I raised my hand and became the proud new owner. 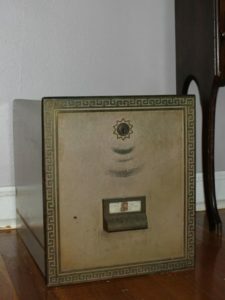 One of these days I am going to ask Phil to build a wooden enclosure to turn the post office box into a little safe, but for now it’s a handy spot to drop the daily newspaper. A lovely elderly lady used to live directly across the street from us. Ellen owned a little dachshund that Laura liked to pet, made delicious cherry cider jelly, and graciously allowed her neighbors access to the city park through her back yard. As she got older and her health declined, she moved to California to be nearer to one of her daughters. As a thank you for visiting Ellen in the hospital and helping to pack her belongings for the moving van, her daughters gifted me with a chair and ottoman that Ellen herself had reupholstered in an adult education course. Thank you, Ellen. Rest in peace. 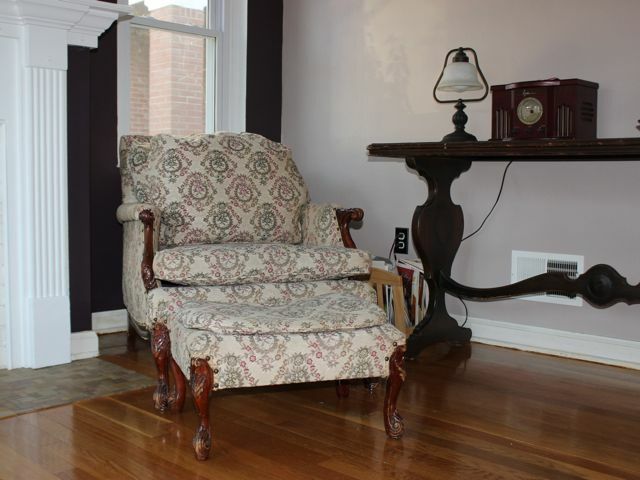 At first glance, it appears that the chair matches our other front room furniture. The colors are spot on, but the pattern is slightly different. It’s amazing how well the pieces coordinate. Ellen’s upholstery is standing the test of time better than the sofa and loveseat, despite being the favorite seat in the house. A few non-“old stuff” details: when we moved here, I noticed that the mirror had a lot of dings and scratches, especially around the edges. Phil suggested taking it down and hanging his rifles there, but I vetoed that idea. Instead, I painted a dogwood border. It took four days to stencil the different layers of color, but I was – and continue to be – happy with the results. Phil’s gift to me the first Christmas we lived here was an IOU for stained glass for the picture window, to be made by some friends who created stained glass pieces as a hobby. 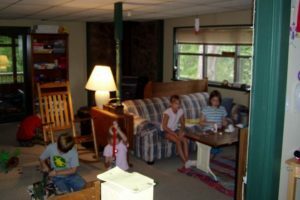 Our design goals were to be consistent with the character of the house, let in as much natural light as possible, and still be able to see children playing in the yard. I designed a pattern that utilized lots of patterned clear glass with splashes of purple and green in a reflective floral motif. 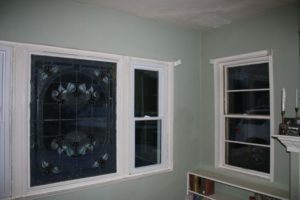 The finished window was installed before the following Christmas. None of the lamps are vintage, but I looked for pieces that fit the mood of the room. The floor lamp came from Target, the table lamp on the library table from WalMart. 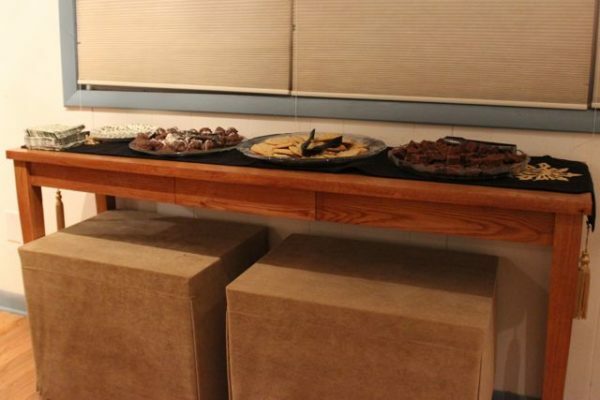 The matching lights on the buffet are from Hobby Lobby, also the source for a replacement teardrop drawer pull and the house plant pillar. I was quite pregnant with Laura at the time I painted the mirror, which means it was done more than 18 years ago – creeping toward antique status. Our house was built in 1952 by a contractor for his own family. It is, as our inspector put it, “substantially built,” using steel I-beams and brick over block construction. It also has some lovely design details, such as the picture window, arched doorways to the foyer and hallway and a pocket door to the kitchen. The fireplace also has a nice feature: air intake grilles on either side and a vent on the front. This allows more heat from a fire to remain in the room instead of escaping up the chimney. That is the history of how our front room developed. 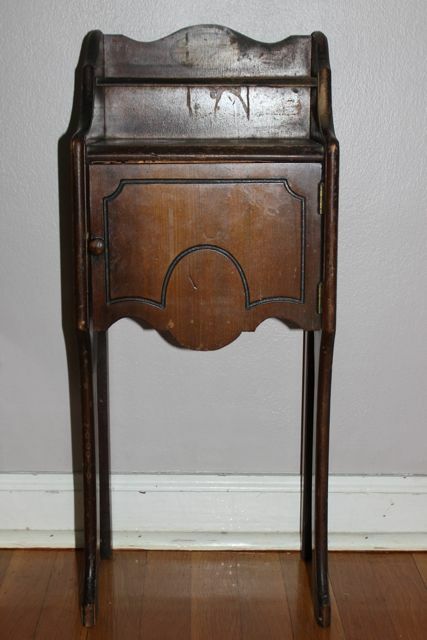 Next week’s post will feature some of our newer furniture pieces and what makes them extra special. Confession: I am a pitiful documentarian. 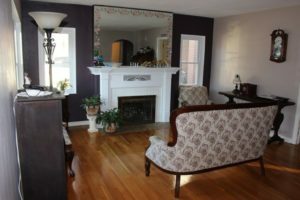 When I began to compose today’s post, I realized that while I was able to take any number of “after” shots of this remodeling project, I did not remember to take “before” pictures. Fortunately I have another confession: I am extremely poor at deleting – much less organizing – computer files, so I was able to peruse a plethora of old digital photos for your viewing pleasure. Phil, Hanna and I moved into this house (from across the street) in April 1995. The front room was freshly painted in a restful shade of seafoam green. The color went fine with our furniture so we opted to leave it. 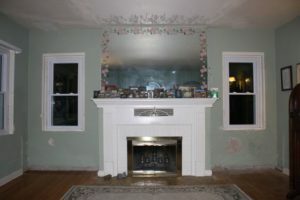 Over the next 18 years we stenciled a border around the fireplace mirror, designed a stained glass window to fit the picture window, acquired various antique pieces and repaired some moisture damage in the southwest corner. With two additional children the walls took a normal share of abuse, but it was always far easier to touch up the existing color than to make a change. 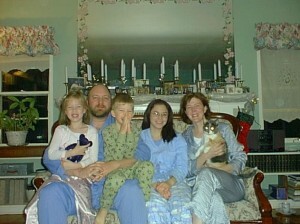 This Christmas 2002 family picture includes a view of the west side of the front room. Early this year we updated the drafty steel windows with energy-efficient vinyl replacements. This was a very good decision, although the old steel frames could not be completely removed and every one of the 18 windows would need touch-up paint. You can observe several things in this photo – the stained glass window, a new vinyl window, an old steel window, one of the built-in bookshelves and a patch in the ceiling. 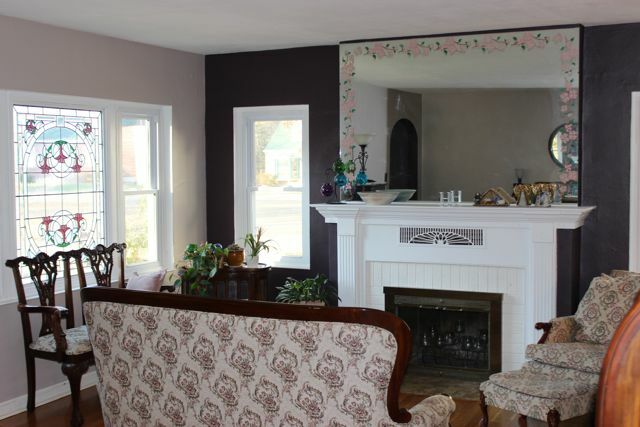 I had never cared much for the floral valances and decided not to rehang them. I also did not like the shelves that had been built in on either side of the fireplace and asked Phil what he thought about removing them. He had no objection, so I got out a hammer and a crowbar and went to work. Before long, I realized this was turning into a Big Job. The west wall after removal of the bookshelves, showing the missing baseboards, plaster damage and different paint where laths were removed from around the windows. What a mess. 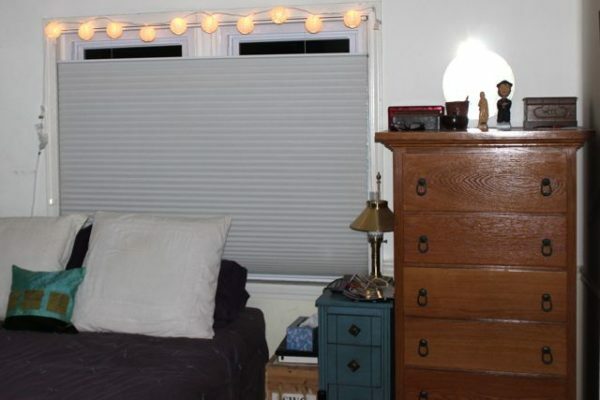 Since the window treatments weren’t being rehung, I removed the curtain hardware and some wooden laths that had been cobbled into faux frames around the west windows. It was more than obvious that the room would require a major repaint. Phil gave me complete control over color, just as long as it wasn’t green. Once the dust had settled from deconstruction, however, momentum came to a standstill as other circumstances demanded our attention. Hanna left for graduate school. Phil was unexpectedly laid off from his job. Laura and Joseph had busy summer schedules. Phil and I both applied for jobs. School started again for the kids and Phil went back to work for an IT consulting group. Both of the grandmas had eye surgery. By fall we had finally settled back into a semblance of normal routine and it was time to get back on the painting project. We wanted to finish by the time we hosted Thanksgiving dinner. 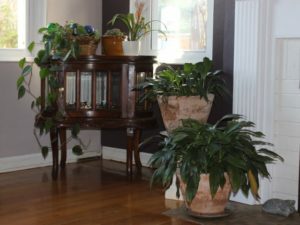 The project involved the front room, foyer and a hallway. The original color scheme was SW0103 – Bayberry in the front room and hall with a darker shade, SW1181 – Scrubbed Pine, in the foyer and inside the archways. All paint colors are from Sherwin Williams. 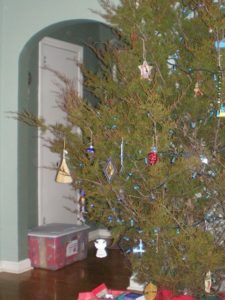 This shot shows the Bayberry and Scrubbed Pine colors as well as our 2007 Christmas tree, the last cut tree we had before I was diagnosed with an allergy to cedar. I put together a palette of three new colors, but first I had to patch the plaster and paint the ceiling. I used Valspar Color Changing Ceiling Paint from Lowe’s. It goes on purple and dries white so it is much easier to see what has already been painted. 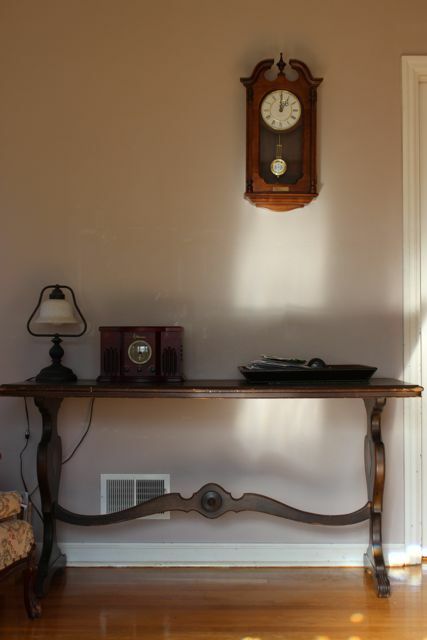 Then, because we were covering fairly dark colors, I prepped the walls with a primer tinted SW6035 – Gauzy White. 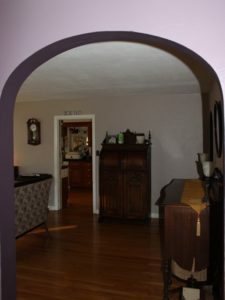 Next I painted the hall and foyer in SW6270 – Soulmate, followed by SW6037 – Temperate Taupe on three walls of the front room and finished with SW6272 – Plum Brown for an accent wall and inside the archways (satin finish for all wall colors). 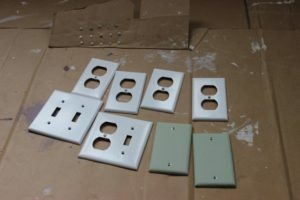 Finally, I spray-painted all of the electrical outlet covers and switchplates and freshened up the mantel with the same color I had used on the window frames, SW7006 – Extra White in a semi-gloss finish. Cleanup included polishing the hardwood floor. I finished just in time for regular Thanksgiving preparations. All of the new colors, including the ceiling, can be seen in this view from the foyer. We are quite pleased with the final outcome. 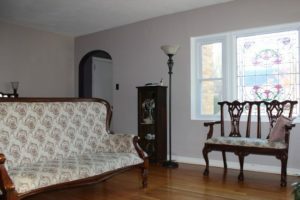 At first I was disappointed because I had envisioned the taupe walls as more brownish than mauve, but the color varies depending on lighting and coordinates well with the plum shades as well as the furniture. Bonus: the accent wall really pops the color of the flowers in the stained glass. Another view from just inside the foyer, showing the seating area of the front room and the accent color on the west wall. No more cheap-looking shelves! The remodel job is not quite finished. We still need to patch the baseboard where the bookshelves used to be – probably by harvesting baseboard from inside a closet – and all of the trim needs to be repainted. We plan to have the floors refinished and the hardwood guy instructed us not to paint the baseboards until after that has been completed. I can live with that! 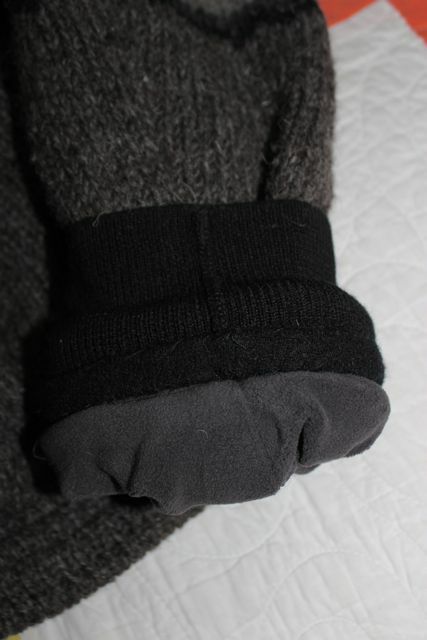 In the interest of self-improvement, I would like to document a couple of things that were invaluable during this project. The first is the PaintStick, an ultra-cheap impulse buy from the clearance section at WalMart. It is a paint roller that draws paint directly from the paint can into a hollow handle. 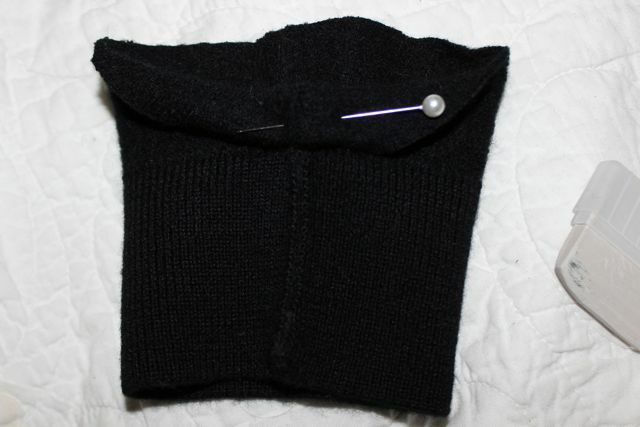 It saved both time and wear and tear on my back. The second is a series of instructional videos at the How to Paint a House Right! website that taught me proper painting techniques. I can now cut in a mean ceiling line without taping. 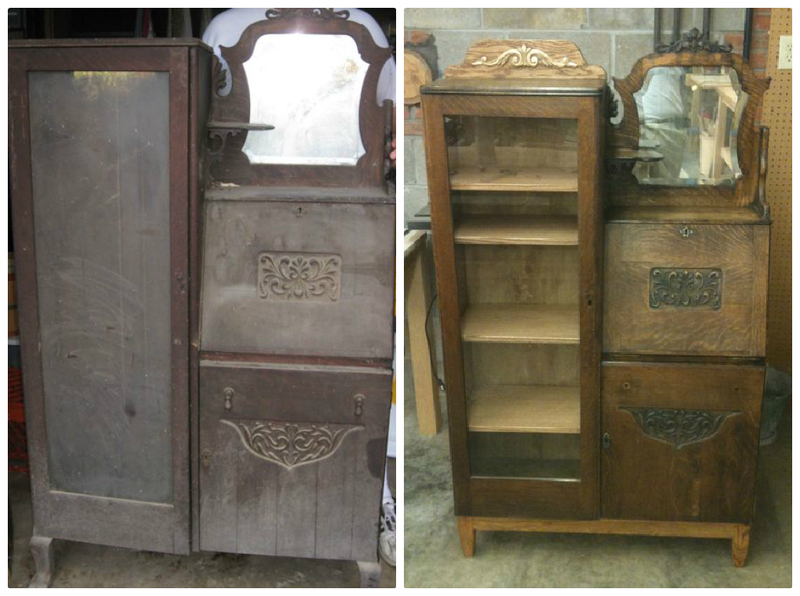 Next week: stories behind some of the antique pieces we have in the front room. Since my last post on home renovation, I am still hard at work painting the old steel frames to match our new windows. 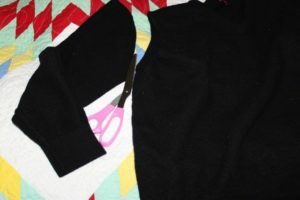 I started in the downstairs bathroom, where, as such projects are wont to do, my workplan took a detour. 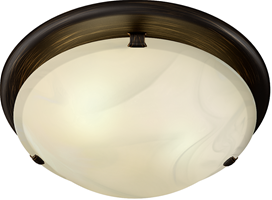 with a new one to match the other fixtures in the bathroom. Isn’t it pretty? It didn’t take long to discover that the ceiling opening required for the new fan did not match the existing one and would require significant patching following an already complicated process to replace the unit. Reluctantly, we returned the new fan and looked for a replacement fan grille instead. Menard’s carried only the entire fan kit, but a clerk thought we might be able to special order the grille. 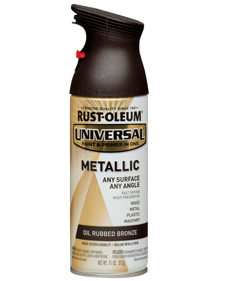 According to the label, Rust-Oleum Universal Metallic Spray Paint (Oil Rubbed Bronze) works on most surfaces, including plastic, and does not require a separate primer. I snagged a can and headed home. Still not as pretty as the round fan, but a huge improvement nonetheless. The photo really does not do it justice. This paint is seriously great stuff. There were a few hiccups along the way. I forgot to hit the inside angle of the louvres, and although I followed the label directions exactly (recoat within one hour or after 48 hours), the finish blistered a bit. I had to wait for that coat to dry, then sand the bubbles off, then wait another 48 hours to repaint. The finish still is not perfectly smooth, but it’s not very noticeable and besides – it’s on the ceiling. We also disrupted the paint around the grille while removing it, but that repair will just have to wait its turn. 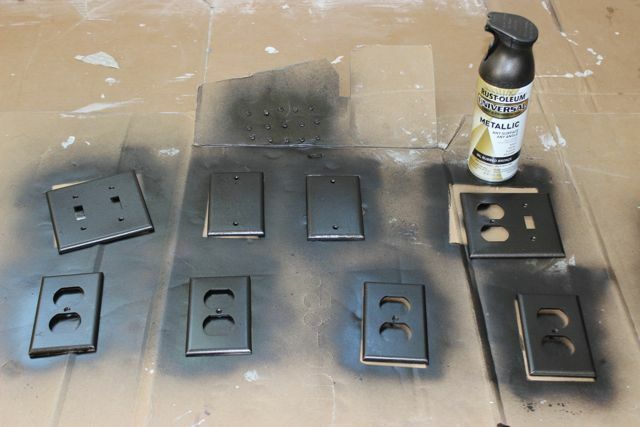 Cost of the spray paint: just under $8. It would have cost $98 for the new bathroom fan (plus the aggravation of changing it out and patching the ceiling) or about $35 to have a new grille shipped to us. But wait – there’s more! The bathroom floor vent had corroded, and since it had to be cut to fit an irregular opening, we never seemed to get around to replacing it. 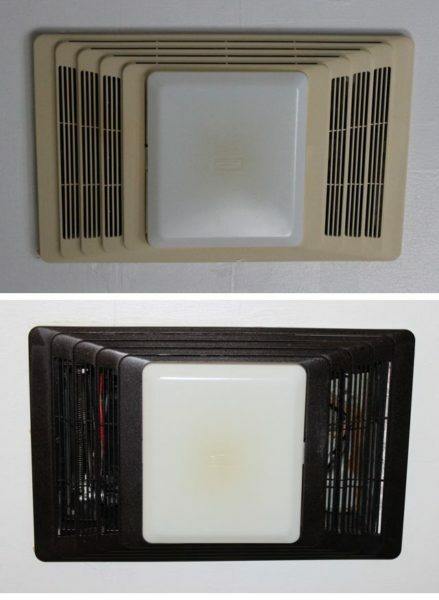 Emboldened by my success with the fan grille, I painted the vent as well. 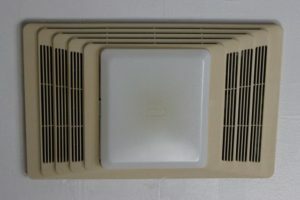 I’m not sure of the cost savings as I have not priced replacement vents, but I estimate $10-$15. 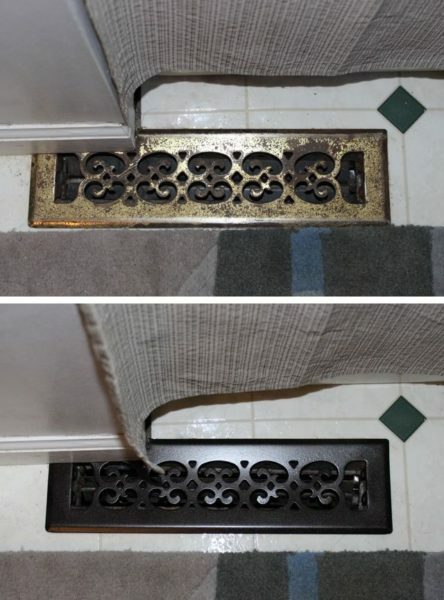 The floor vent turned out even better than the bathroom fan. So well that Rust-Oleum featured it on their Facebook page! I can envision all kinds of other uses for this paint. I may try painting the shower fixtures this summer. 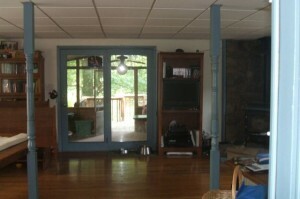 The front door hardware and fireplace screen are also on the list of possibilities. But for now, it’s back to painting window frames. I must admit that my constructions were never that elaborate. First, because we did not own anywhere near that many dominoes; second, because I never thought about augmenting with playing cards (which is brilliant, by the way), but primarily because I am not blessed with that kind of time and patience. Life is full of examples of the “domino effect,” where one simple event leads to another and another and yet another. Like a little cover-up fib that requires a more and more elaborate background story to hold up. Or a fabulous clearance-rack sweater that doesn’t match anything else in your closet but happens to look great with that pair of jeans and those shoes and *oooh! * the earrings over there (too bad they’re not on sale, too). Homeowners are especially well-acquainted with this phenomenon; the older the home the more pronounced the effect. Our house was built in 1952, with steel windows that were installed between concrete blocks and brick during construction. They were top-of-the-line back then, but sixty years later Phil and I were ready to replace them with more energy efficient and easier to clean vinyl windows. Problem was, the solid construction made the window frames nearly impossible to remove. The only way to avoid astronomical labor fees would be to remove most of the old window, then slide the replacement into the old steel frame, leaving a small steel lip around the new window. We ordered our windows last November, and they were installed right after New Year’s. New vinyl window to the right of picture window, as compared to old steel window on adjacent wall. I knew going in that there would be some trim painting involved, both inside and outside. What I did not realize was that the new windows would be a much brighter white than the color we already used on trim all over the house. All righty then, some of the window sills need to be repainted anyway. 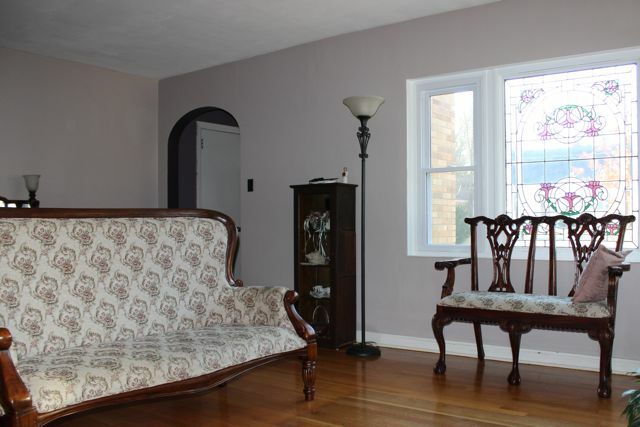 But the window trim also matches the baseboard and doors. Well, to be honest, the baseboards and doors have also needed attention for the past couple of years, or maybe five. 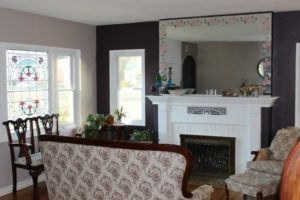 As I washed the new windows and began the prep work for painting, I removed some ugly trim that was put up in the front room to attach window treatments that we no longer use. 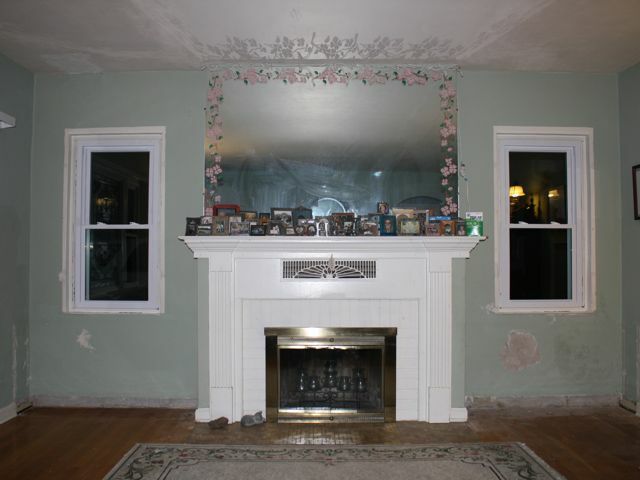 Under these same windows there were some less-than-attractive shelves built into either side of the fireplace. I have never liked them so Phil and I decided to rip them out, leaving a few chinks in the plaster. The plaster needs to be repaired, and we’re going to need to repaint so why not pick a new color while we are at it? We’ve put off refinishing the hardwood floors for a while, and just look at the difference where the shelves were . . . you can probably guess where this is heading, and we haven’t even made it out of the living room yet. Christmas 2002. Note the shelves on either side of the fireplace behind us, as well as the wooden frames supporting the window treatments. January 2013. Shelves, curtains and window frames are gone. The dominoes, they are a-tumbling, but the first one toppled long before we bought replacement windows. 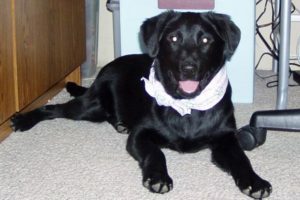 Just after Christmas 2005, Phil came home and told me that one of his employees had offered to give us a five-month-old black lab puppy. At the time her littermates were being sold, she was being treated for a cut under her eye, so they ended up keeping her. Now they wanted to find her a new home before her mother delivered another litter. Phil and I went to see her, and of course brought her home. Laura named her Daisy. Daisy, happy to be living in her new home. Daisy had lived outside for five months and her house training was a bit rough at first. We installed a baby gate to confine her to the family room, but despite diligent attention, she had a few accidents. Once she got the hang of letting us know when she needed outside, it was time for the old carpet to go. Instead of replacing it, we opted to install hardwood floors. Then we had to paint, because the walls looked shabby next to the gleaming floors. And speaking of shabby, the aluminum windows were practically falling apart. Wouldn’t top-down bottom-up shades be wonderful with the new ones? The woodburning stove was too hot and too smoky; what about one with a door to see the fire? Wow, look at how much the ceiling tiles were sagging. The lighting was dismal. We wanted more seating. 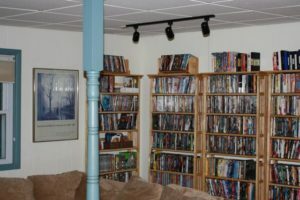 We needed more shelves for DVDs. We didn’t really need a bigger TV but we bought one anyway, and Phil built a media cabinet to measure. New windows, shades and sectional. New ceiling tiles, DVD shelves and track lighting. 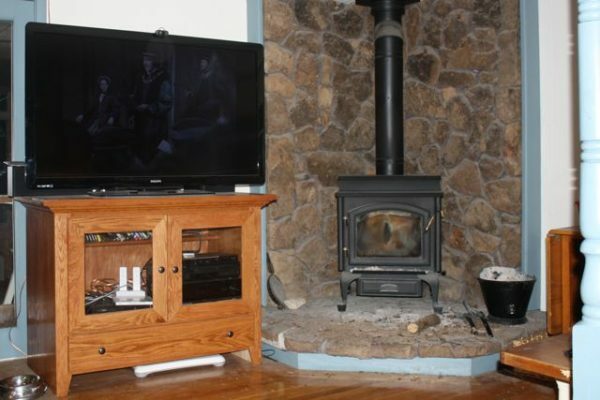 New woodstove, media center and massive television. Before you knew it, our free dog was well into four figures. I suppose one could argue that we would have undertaken these projects sooner or later anyway, but I’d just as soon credit the dog. It’s not the worst thing she’s blamed for! If I knew seven years ago what I know now, her name wouldn’t be Daisy – I’d have called her Domino.